Our time in Paris was the epitome of magical. Writing this post is making me remember just how much there is to the city, and how it caused us to fall in love with traveling. It seems we did so much while there–but at the same time, we missed so much, too. 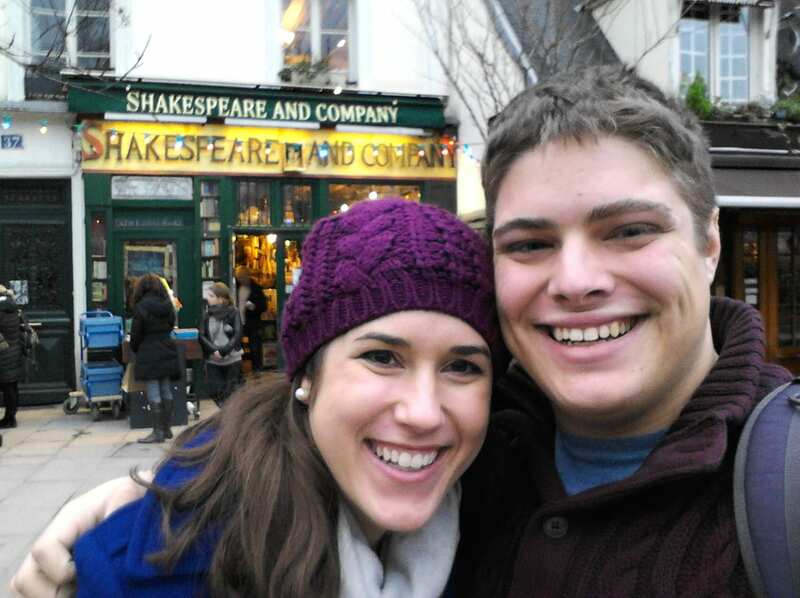 Due to a combination of limited time and rookie mistakes, we missed out on some of what Paris has to offer. That being said… we did get a great snapshot. Here are 5 of our favorite sights in Paris (skipping the 5 most obvious: Eiffel Tower, Notre Dame, Arc de Triomphe, Louvre and a trip to Versailles, and opting for more unusual things to do in Paris). Stop! This is the empire of the dead. 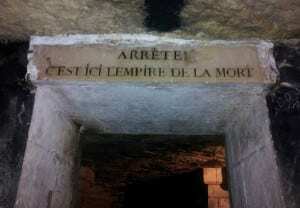 I could talk all day about the catacombs. 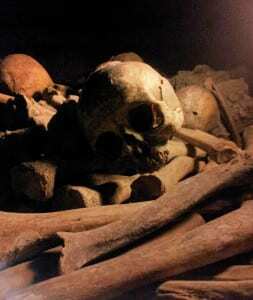 Underneath the famous Parisian landscape lie 6 million skeletons–pile upon pile of disassembled bones–which rest in an absolute labyrinth of tunnels. The bones were moved there over time, as graveyards were emptied out due to public health risks. It is a disturbing and incredible sight, and the sheer expanse of the place is breathtaking. Around every dark corner is another hall, with bones forming walls stacked taller than my 5’6” frame. The bones are broken up by various artworks, mostly Christian in nature–collective burial statues, prayers, that sort of thing. They are a sight to behold. The catacombs are open from 10am-8pm, Tuesday-Sunday. I strongly recommend getting there very, very early–they limit the catacombs to 200 visitors at a time, and most people spend about 45 minutes in them (though I think we took longer). If I remember correctly, we got in line around 8:30am and made it into the catacombs around 10:45am–and that was in the off season! I highly, highly recommend very comfortable shoes–between the tour itself and the several hours in line, my “comfortable” boots felt like I was walking on knives by the end. This royal, 13th century chapel is absolutely beautiful. It’s a shame that its beauty is somewhat overlooked in favor of nearby Notre Dame, because Sainte-Chapelle has a unique look that is just as worthy of admiration. The chapel is separated into two levels: the lower chapel and the upper chapel. The lower chapel is lovely and subdued, but certainly not the showstopper. Up a narrow staircase is the upper chapel–a magical room with walls made entirely of stained glass. The ceilings are cavernously high, making the stained glass that reaches all the way up and around an absolutely magnificent sight. Like many places, Sainte-Chapelle suffered damage during the French Revolution, and many of its artifacts were stolen–some recovered, some not. Incredibly, though, a full ⅔ of the stained glass in the upper chapel is still the 13th century original work. More than 750 years after its completion, Sainte-Chapelle is standing strong, even with its objectively delicate exterior. Cost: 8,50 Euro, with discounts available for young EU residents and a few other groups. Okay, yes, Jeremy and I are both major book nerds, so this may not hold everyone’s interest as much as ours. This (rightfully) famous bookstore has been the haunt of many well-known authors, and is the type of place where anyone could get inspired. Located just steps away from the Seine and with a great view of Notre Dame, the odds are most Paris visitors are going to be nearby anyway. It’s worth stopping in. Sadly, the rare book section was closed during our visit. The interior of the main shop, however, was enough to keep us entertained for ages. Books upon books–they are absolutely everywhere. Crammed into shelves reaching up to the ceiling. Stacked on tables. Piled on the floor. Narrow pass throughs that people need to squeeze through make the picture clear: humans are visitors, but the books rule the shop. Strangely, though, this doesn’t give off a claustrophobic feeling as much as a magical one–as if you have been transported to another land. The decor, of course, is literature inspired–because how could it be anything else? We eventually talked ourselves down to only 3 books, including a gorgeous copy of The Great Gatsby that I just couldn’t bear to leave behind. Cost: Well, it’s free to enter… but the true cost simply depends on your levels of self-control and obsessive love of all things literary. Super excited about our book purchase. Confession: we didn’t pay (or more important to us, wait in line) to reach the top of any of the famous monuments. We found it unnecessary with the incredible cityscape visible from the front of Sacré Coeur. Plus, as a bonus, the Eiffel Tower is visible in this view. The interior of Sacré Coeur is gorgeous, of course, but not out of the ordinary or particularly ornate for a European Cathedral. It is free, however, and certainly worth a quick walk around (and if you come up the front like we did, you’ll be ready for a little rest after climbing that hill to reach the top). After taking a look around the basilica, it is a perfect time to wander the neighborhood of Montmartre. It’s a gorgeous, artsy district, full of cafes and shops selling artwork. Moulin Rouge is also in the area, though sadly we didn’t get to see it (next time!). It was a blast to wander through a courtyard where groups of artists were working on and selling all types of pieces in the open air: pottery, drawings, paintings–anything you can think of. It took a lot of self-control not to come home with a pretty oil painting of the neighborhood, and truthfully, I still wish I had sprung for it. Cost: Free! At least, unless you decide to take home some art. Isn’t it gorgeous? I just love that view. We loved this museum. 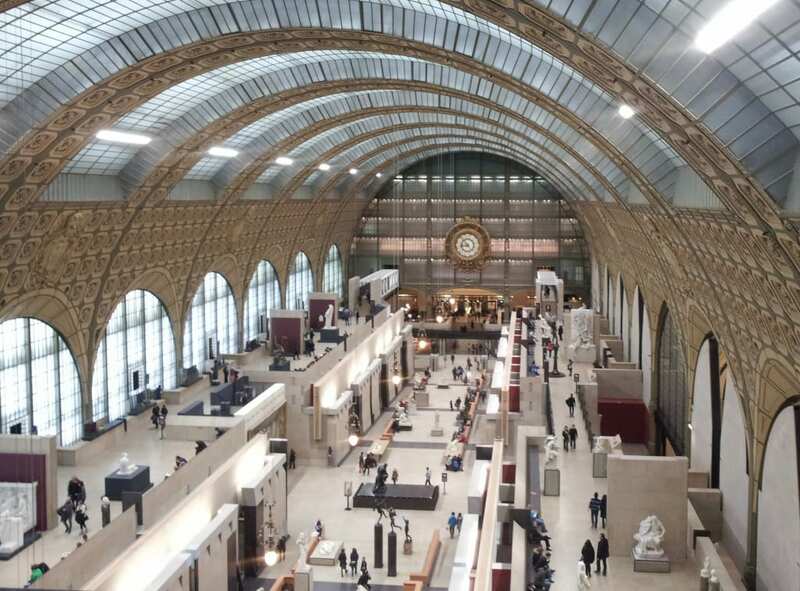 The Louvre was spectacular, as well, but Musée d’Orsay is just somewhat more… manageable. Despite having multiple levels and an almost maze feel to it, the museum is very well laid out, not overwhelming, with incredible selections of artwork. I particularly enjoyed the Monet’s and the sculptures. We went in the evening and spent about 3 hours, and the crowds were not remotely overwhelming. Cost: 11 Euros each, with various discounts available. 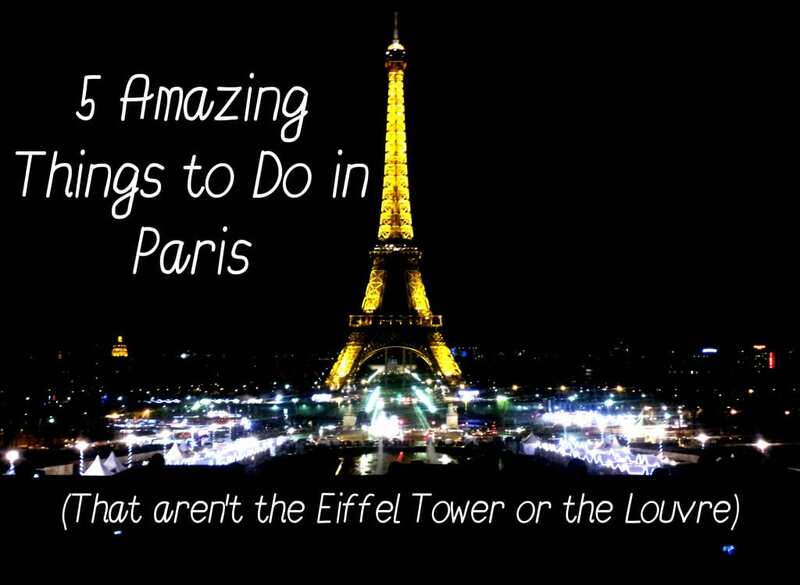 This list doesn’t even touch all that Paris has to offer, and really, I could likely add 5 new things to it on our next trip to Paris without any overlap (not to mention things to do in the rest of France! ), because there is so much we didn’t see (Musée Rodin, a great view of the cityscape at night, and the gardens in bloom, just to start). Regardless, though, each of these places is special enough that it will get a second visit next time, and maybe even a third. Planning a trip to Paris? Check out this great 3 days in Paris itinerary to get you started!